Product information "Inverto Unicable I / II LNB 1/32 - IDLU-32UL40-UNBOO-OPP"
UniCable LNB for use with devices according UniCable (standard EN 50494 - 8 User bands) and UniCable II (new standard EN50607 - 32 User bands). Through the combination of both standards, older devices can be used, here are the first 8 frequencies available. Professional Unicable LNB - 32 User Bands - No headend or QAM modulator longer necessary. Unlimited supply of receivers / STBs in static mode or via the Standard Unicable II - 32 User Bands - Perfect for TV cards of Max, Cine and DuoFlex series and everywhere many receivers must be supplied as in apartment buildings and building complexes. The 32 User bands (frequencies) can be used as static routes for the transport of selected transponders from the satellite, whereby an unlimited number of receivers / tuners can be supplied or via the standard Einkabellösungsvariante according EN50494 / EN50607 to 32 receivers / tuners with direct Unicable Frequency Allocation. Digital channel stacking technology uses fast wide­band analog to digital converters and applies digital signal processing to select desired transponder channels, up convert them and stack them as IF signals over the Unicable output ports. The Unicable2 LNB offers a full flexibility of channel selection, supports many more set-top-boxes over existing cabling thus significantly reducing cost and simplifying installations at subscribers homes. The Static mode, allowing an unlimited number of receivers to be connected to the LNB, makes multi-room distribution and MDU installations substantially cheaper and simpler than ever before. The operating mode - dynamic or static - output power level, channel bandwidth, UB numbers, center frequencies and dish alignment mode are all programmable and can be configured and updated in the field using a dedicated programmer device*. 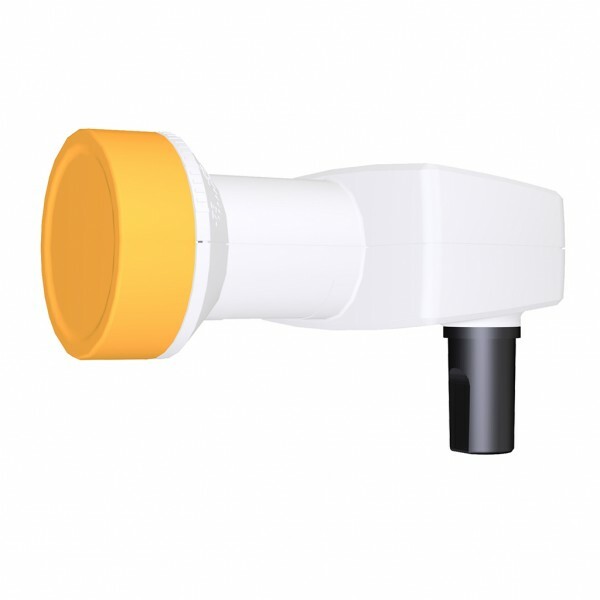 This Unicable2 LNB enables installations with up to 32 satellite receivers connected over a single coax cable and using the EN50494/EN50607 protocols providing access to unlimited number of transponders (also known as ‘Dynamic’ mode) . Alternatively, it can be configured to deliver a fixed mapping of transponder frequencies to IF frequencies (also known as ‘Static’ mode), allowing an unlimited number of receivers to be connected and providing them access to up to 32 transponders (or more, depending on the bandwidth of the desired transponders) based on digital channel stacking technology. The LNB can be powered over a connected STB or by an AC/DC adapter over a power inserter in case the STB is unable to provide the necessary power. The Unicable2 LNB is backward compatible, fully compliant with both EN50494 and EN50607 standards and integrates seamlessly into EN50494-only or mixed EN50494/EN50607 installations of compatible STBs, Next Generation PVRs and HGWs. * Programmer not included, sold separately as an optional accessory. Related links to "Inverto Unicable I / II LNB 1/32 - IDLU-32UL40-UNBOO-OPP"